Please join wolfSSL with senior engineer and security expert Daniele Lacamera for the live webinar Introduction to Secure Boot next week! The webinar will cover what secure booting is, how one functions, the design and implementation of wolfSSL's secure bootloader wolfBoot, and time for Q&A. Be sure to follow up after registering for the webinar by confirming your email, and mark your calendars! TLS 1.3 has some significant changes from TLS 1.2 that are targeted at performance. This is the fourth part of six blogs discussing the performance differences observed between TLS 1.2 and TLS 1.3 in wolfSSL and how to make the most of them in your applications. This blog discusses the server generating a key pair before the handshake starts. As mentioned in the first blog in this series there is a way to mitigate some of the key exchange cost in TLS 1.3. If the server knows which key exchange algorithm will be used, it can preemptively generate a key pair after accepting a TCP/IP connection by calling wolfSSL_UseKeyShare(). In an architecture where both end-points are controlled by the same entity, a choice of security parameters, like the key exchange algorithm, is made upfront and can be relied on. When directly connecting to a server, typically, a client only starts creating the ClientHello once a TCP/IP connection has been made. The server accepts the connection and waits for the client to generate a key share and send a ClientHello message. In this time, the server can also generate a key pair. When using DH for key exchange this provides a significant saving as key generation is expensive. For example when using RSA for server authentication and running both client and server on the same computer, the connection is about 20% faster and with session reuse or PSK for server authentication, the connection is about 30% faster. For connections using ECDH with ECDSA for server authentication, the connection is only about 4% faster and with session reuse or PSK for server authentication, the connection is about 7% faster. EC key generation is very fast in optimised implementations and the impact of hiding its cost is therefore less. Servers currently reuse the ephemeral key pair across multiple connections. It is common to regenerate the key pair once an hour up to once a day. This mechanism can be used instead of server pre-generation but at the cost of perfect forward security for the server. 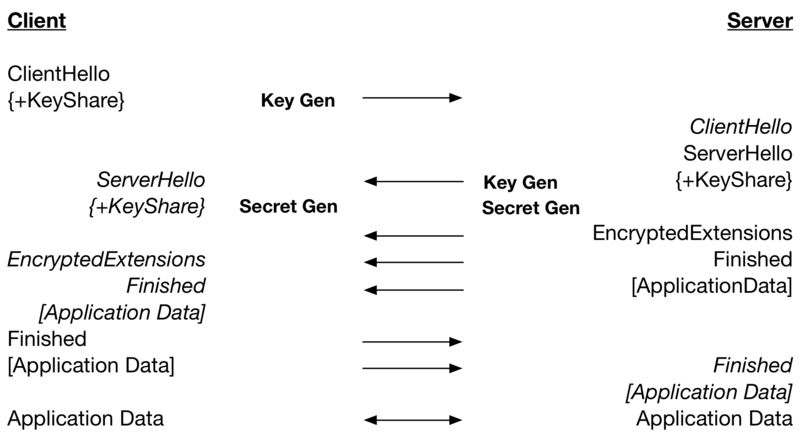 If your architecture allows for it, the server should be implemented to generate the key pair after accepting a connection. For DH, it is well worth it. But even for ECDH the small performance improvement will result in more connections per second. The next blog will discuss the performance issues with handshakes performing client-server authentication.